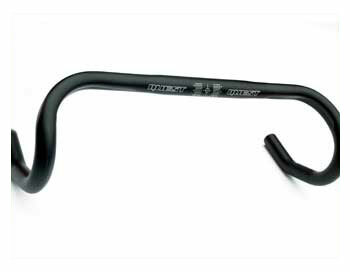 New for this season are our own design compact race handlebar made with 7050 series triple butted alloy. 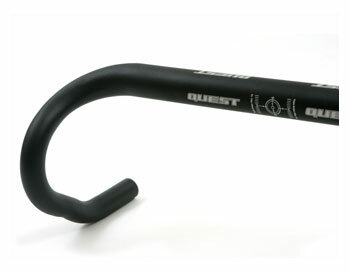 With 125mm drop and 80mm forward extension these bars give superb and conmfotable grip. Fully integrated carbon fibre aerobar with adjustable tri bars and arm rests. 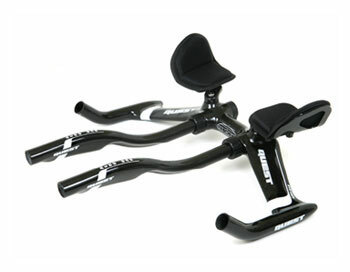 The armrests can be adjusted for width and angle whilst the aerobars can be adjusted for length forward and angle. Made to fit 11/8" ahead fork steerers and weighing approx 737gms complete. Available in 42cm width and to fit oversized 31.8mm handlebar stem clamps. Moulded cable routing on the underside of the bars for brake cabling. Our lightest (approx 210gms) full carbon fibre road handlebars in anatomic shape with flat aero upper section for improved grip and comfort. Differing from our standard carbon ergo bars in having a shallower drop and less forward reach which is the popular choice for professional riders. Suitable for 31.8mm stem fitting. Finished in clearcoat varnish finish and Quest decals. Monocoque one piece carbon fibre handlebar and stem unit with anatomic shape. Ultra rigid and light for the ultimate road bike. Supplied with Computer bracket extension, and available in a range of sizes. All measurements for width and length are centre to centre. Lightweight alloy road bar with anatomic lower shape and flattened ergonomic top section. The top section is then wrapped in carbon fibre to add strength and rigidity as well as give a more attractive apearance, as well as improving the integrity of the bars. Suitable for all makes of control levers with concealed cable routing through the bars. Lightweight alloy ergo handlebar with flattened top section for added comfort and hand support but at a lower price point than our carbon model. Finished in a hard wearing anodised matt black. 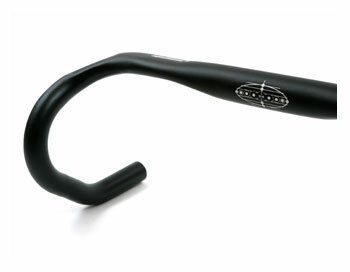 6000 series alloy anatomic handlebar. Construted with 31.8mm centre that extends along the whole top section of the handlebars resulting in much increased rigidity with very little increase in weight over the standard anatomic bar. The rider also benefits from improved grip in this area due to the bigger surface area of the handlebar at this point. 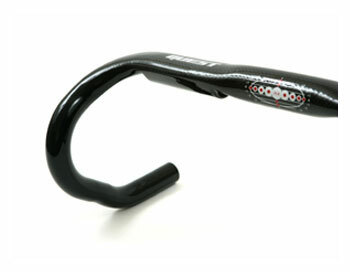 6000 series alloy anatomic handlebar for 26mm diameter stem. 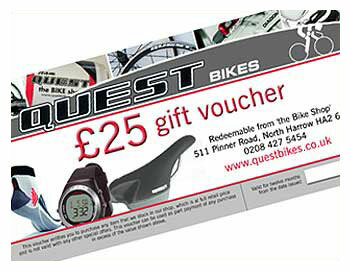 Award winning design one piece carbon fibre handlebars and stem unit. Compact shape full carbon fibre race bike handlebar with flat top section and varying diameters to width size. Wide and flattened centre section for clip on bar compatability and double width single groove for improved stiffness and fatigue life. 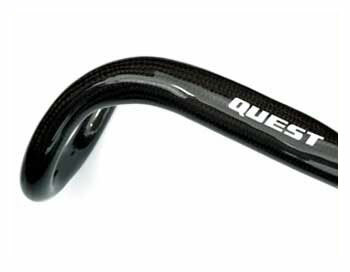 Traditional curved road bike shape handlebar for the purists! Wide centre section for clip on bar compatability and double width single groove for improved stiffness and fatigue life. New style shape full carbon fibre race bike handlebar with anatomical drop of a compact bar but with the deep drop of a traditional bar. Performance, lightness and comfort in a unique design. 80mm reach for best ergonomics on the hoods with the latest generation integrated shifters, maximum comfort when on top of the bar thanks to the elongated section. Full Carbon 1K Anatomic Handlebar. Oversize attachment area for stiffness and durability, ovalized transversal section for comfort. Monocoque one piece carbon fibre handlebar and stem unit with anatomic hape. Features also include detachable computer mount bracket and titanium fixing bolts. Available in a range of length and width combinations. Riders are evolving; so are bikes; so are handlebars. 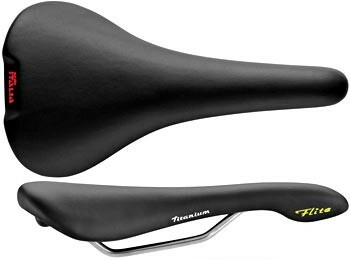 Extremely short drop (128 mm), for those riders who have more than 9 cm higher saddle than handlebar position. Very compact reach: 77 mm, to accommodate the extra long modern control levers. Patent design Continuous Incremental Radius, to overcome the limits of anatomic shape, which allows you to hold the handlebar in only one position. Triple butted alloy handlebar with anatomic shape, twin cable grooves and oversized stem clamp area for increased stiffness. Available in widths: 42, 44 & 46 cm measured outside to outside. 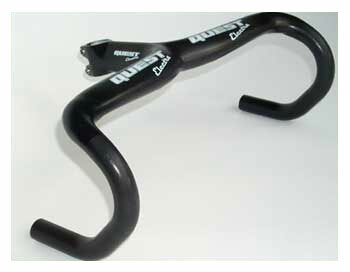 7000 series butted alloy handlebar with anatomic shape.